N RETURNING TO Bethany, Jesus heard that Lazarus, the brother of Martha and Mary, two sisters whom He loved, had died during His absence. Martha met Him weeping, and told Him of their grief saying "Lord, if Thou hadst been here, my brother had not died," for she knew Jesus would have saved him. 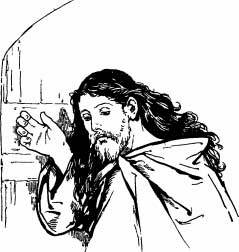 Jesus Himself wept to see their sorrow, and going to the grave ordered the stone to be rolled away and called Lazarus to come forth. Lazarus did so, and many of those present believed in Jesus, but others went away and told the High Priests and rulers, who were much troubled. They said "If we let this man go many will believe in Him, and His adherents will become too powerful, and will take our nation away from us."